To proceed further, create one more object named course. 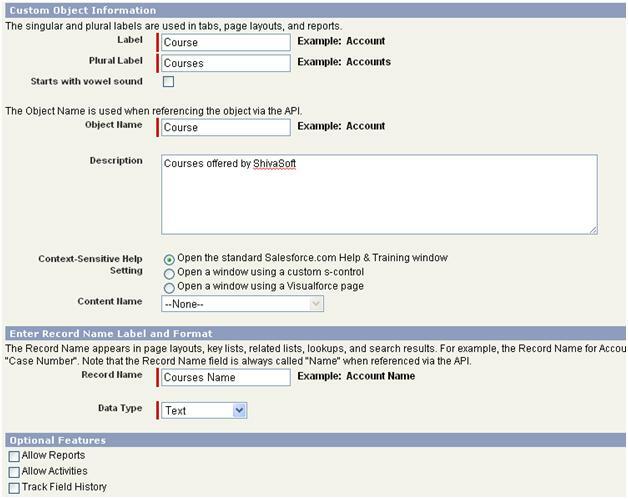 Create below two fields in object course. fields course Name saves the name of course and fees saves the course fees. As you can see that Fees datatype is currency , this datatype is provided by salesforce. When you click on create new fields on next screen you will get the list of available datatypes / fields in salesforce. 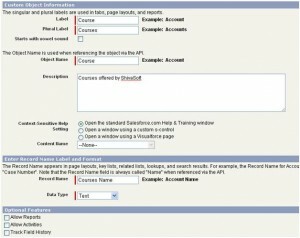 In above list, you might be thinking about the fields Balance, this is formula type of fields provided by salesforce which is automatically created. So lets see, how i have created this field. As you can see, Balance fields will be the (Total fees – deposit fees). So, we have completed the second part of tutorial, which is nothing but the creating fields. in next part, i will teach how to create the Tab to operate on this.